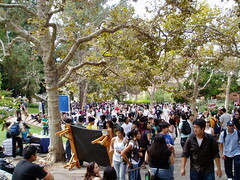 First day of classes yesterday at UCLA and the place was packed. I've been doing some research on campus, learning about the earliest beginnings of the university and it's been useful, in a way, for the buildings and lawns and walkways (and parking lots - dear lord, is that ever a nightmare) to be quiet and mostly empty. But yesterday changed everything. Everything the founders had worked and schemed and fought for was alive in a way they probably never imagined. Bruin Walk (thank you, Beth) had turned from a meditative climb to a marketplace, a gauntlet of students handing out leaflets and booklets and pamphlets of every kind. Free food, free football games, free shampoo. ("Don't make eye contact, baby," a girl behind me told her friend. "Nothing's free.") As the day wore on, handbills papered the pavement, a festive patchwork of safety orange and screaming lime green. I stood for a while between CAL PIRG, the Christian Students Welcome Dinner Sign-up and the Japanese American Association. A girl playing guitar and singing in a reedy voice was drowned out by the thumping bass of the Philippino Students Association's boom box. "My roommate's a freak," someone said. "You can stay at my place," his friend replied. "Hurry. If you're late at Royce, you gotta climb over everybody." "Mom. Mom! Mom? Goodbye mom..."
"I always check out my professors ahead of classes on account of you gotta know where you wanna sit." "Moore Hall? Dude, I know where Moore is." "Hey, you want to help us save the world?" someone called out to a girl rushing by. She looked up, saw a handsome guy, slowed and then stopped. "Ummm, yeah? But first, where's the Young library?"